I think I’d rather be at work. My house is chaos, I’m fairly certain I’m going to run out of underwear before July 5th, and I stupidly agreed to send all things cooking-related with Mr. Prevention tomorrow morning. As in, I will have paper plates and plastic ware Tuesday through Friday. I guess it’s a blessing that Greek yogurt + honey + walnuts + dried apricots is my latest favorite breakfast, snack, and dinner…I guess. I miss cooking already. I mean, look at the colors in this salad. Absolutely stunning, right? It’s that time of year – enjoy it. For the both of us, please? 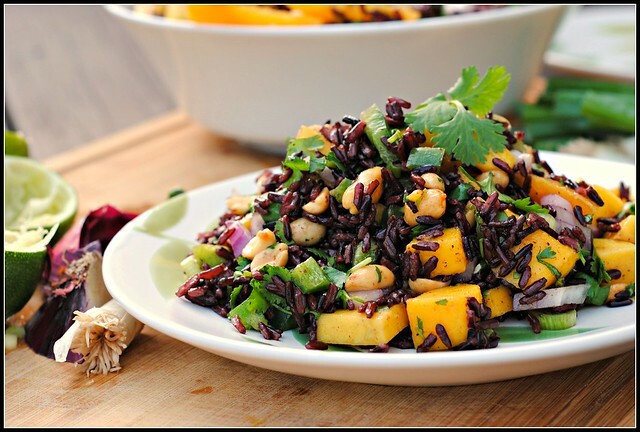 A reader recently asked for black rice recipes. Having never had black rice, this was a request I could not fulfill…at the time. I look forward to many most black rice recipes! I recently saw an article asking, “Is black rice the new brown rice?” and the answer may very well be, “yes”. 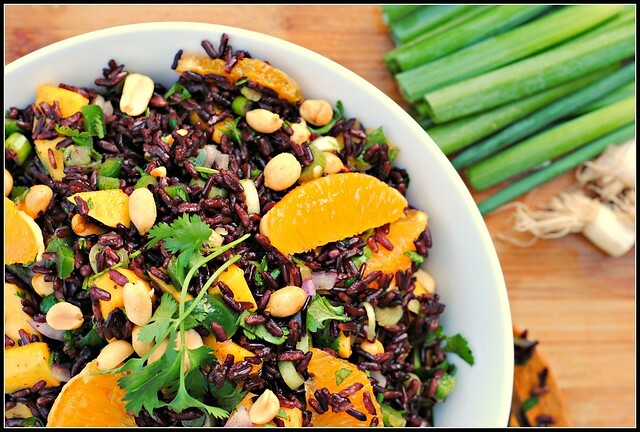 Known for its chewy, hearty texture and plethora of antioxidants, black rice has lots to tout. The antioxidants referred to as “anthocyanins”, are identifiable by their purple and reddish pigments and are also found in blueberries, grapes, and acai. These powerful antioxidants have been linked to reduced rates of cardiovascular disease and cancer, improved memory, and much, much more. Before you write off black rice’s availability, I found some at my local Kroger. It can also be found at Whole Foods or online retailers like Amazon (less than $5/lb for organic black rice). Outside of its stunning appearance and all of its nutritional perks, this salad is only enhanced with fresh navel oranges, spicy jalapenos, super sweet mangoes, and crunchy peanuts. 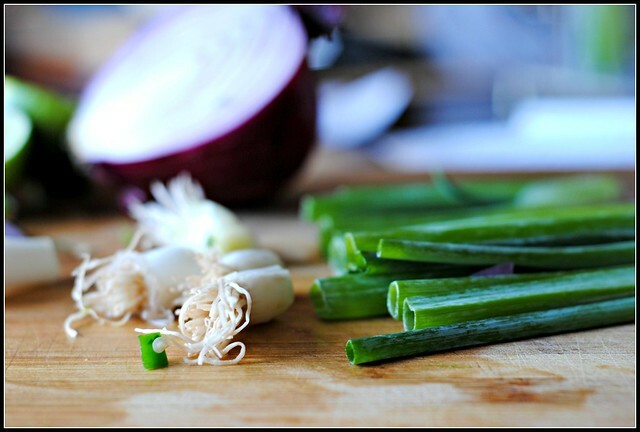 Throw in some tangy cilantro and sweet red onion…muah! Delicious. If you’re wondering how I passed this one off on Mr. Prevention, it wasn’t difficult at all. He was sold when he heard “jalapeno” (don’t worry, it’s not too spicy…and if you want it SPICY, opt for serranos instead!) 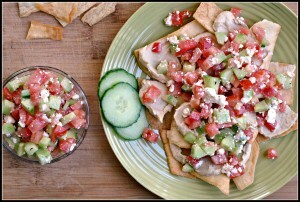 and thoroughly enjoyed this salad as a dinner entree, perfect for a hot summer evening and something on the lighter side. Place mangoes and remaining ingredients in a large bowl. Add rice and toss gently to combine. Season lightly with salt and more lime juice, if desired. *omit for vegan/vegetarian. Result: One summer fresh salad packing some serious nutrition. To make this vegetarian/vegan, omit the fish sauce and you can sub in olive oil instead. I did opt to halve the fish sauce as to not give off too much fishy scent/flavor (when not cooked, I find fish sauce to be a bit intense). I would say this took about 45-50 minutes to prepare, but you can certainly make it ahead of time and it keeps well for 3-4 days in the fridge. A most unique blend of ingredients that is absolutely perfect! Enjoy! Mr. Prevention is working today. I am here with the movers and trying to keep Miss Lily out of their way. The forecast looks HOT…isn’t that always the case with moving? Hopefully the rain stays away, unlike our bike ride yesterday afternoon – we. got. soaked. I giggled a little because you and I are the complete opposite of my friend, Mon. She packed up her cooking stuff (thought she was moving) two months ago and is yet to unpack the box. That is very interesting to learn about black rice. I really want to give it a try now. This salad sounds delicious and looks so pretty. If someone threatened to take away all of my cooking equipment, I’d probably kill them. Just saying. BE STRONG, though! You can get through this. I’m in love with this salad. Mango+peanut…love. I *love* black rice! 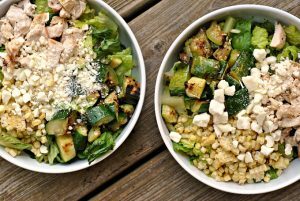 I am so happy I stumbled upon your blog one day – your recipes always look incredible and everything I’ve made thus far has been an instant hit in my house! I don’t think I’ve ever cooked with black rice either – I’ll have to keep my eye out for it – love the sweet/heat combo! Good luck with the movers! Looks delicious!! I’ve never cooked with black rice – I’ll be looking for it though! Moving sounds like such a stressful experience! I have so much clutter/crap/stuff that its going to be a real pain to pack it all up when I move away to college. As for this salad…I love it! 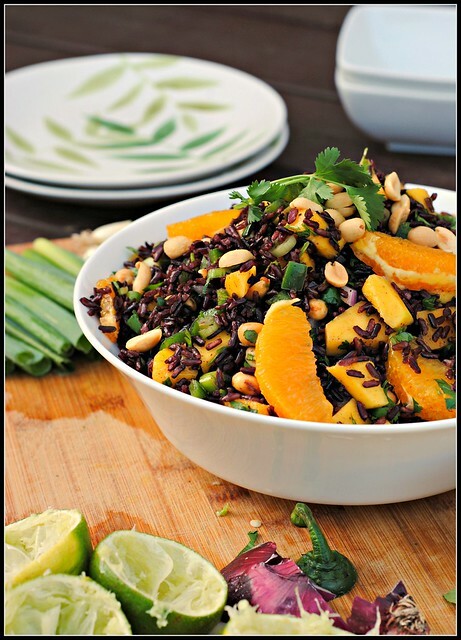 So bright and summery and the black rice looks so cool!